Next to silk sarees, it is the pretty designer drapes which occupy any fashion loving women’s closet. 9 yards of beauty embellished with color embroideries, stone detailing and beads work are this year’s favorite saree trend. These party ready sarees often need more customized blouses compared to your silk sarees. For instance, your silk sarees will mostly have a matching zari blouse with it. So it reduces your work by half. However, the case with most designer saree is, you need a plan to come up with a good blouse for it. 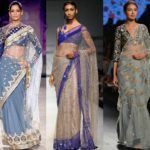 One winning model for any designer saree is a net blouse. That too, a full sleeve net blouse is a must have on your wardrobe, if you have lots of party wear sarees. Why full sleeve net blouse? Simple. A net blouse goes well with any modern adornments that come with a trendy designer saree. Net blouses are highly sensual, sleek and sophisticated to wear. They give such a youthful vibe. 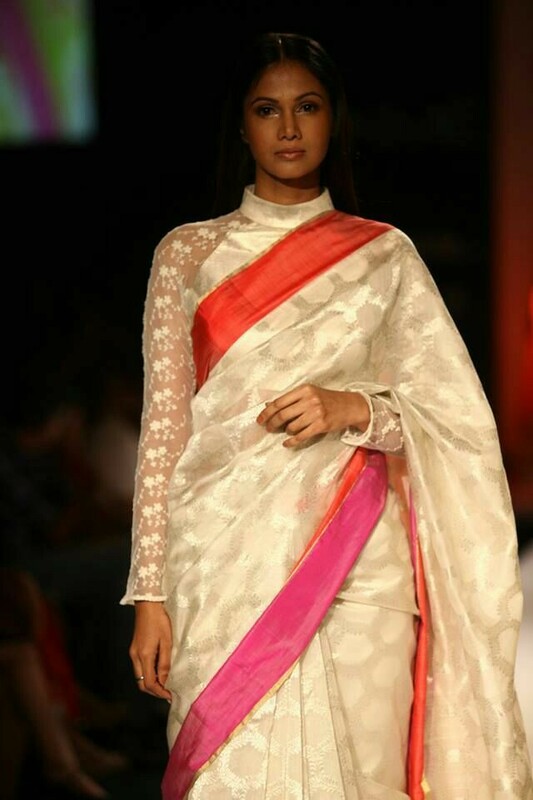 When the net blouses are worn with long sleeves, it adds more stylish vibe to your saree. Those who discard full sleeve blouse owing to the tiring Indian climate should give these sleeves a try with net fabric. Yes, these blouses won’t compromise style for comfort. Besides, full sleeve net blouses are for those who like to keep their saree look slim. The thin net fabric doesn’t add any volume to your look. So you can be your best version on this blouse. Okay, now let’s take a look on all the possible designs you can opt on a full sleeve net blouse. Scroll down and enjoy! We love the metallic thread details on this full sleeve blouse worn by the gorgeous Sonam Kapoor. 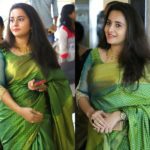 This chunky long sleeve blouse adds edge to this saree look. Add a stylish spin to your traditional brocade blouses by opting for net sleeves and catchy adornments on top of it. Yes, a full embroidery work is going to get more glamorous if it is done on a net blouse. Use contrasting colors to increase the festive vibe. Skin tone net blouse adorned with black beads is a classic combination that can blend effortlessly on all your pastel hue sarees. Brides, take a note on this beautiful blouse. 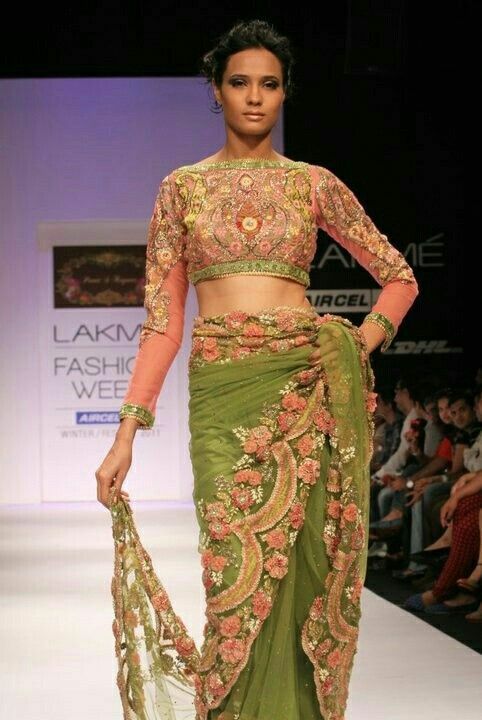 You bridal trousseau should have a saree and blouse like this. Those who like glittery feel do wear your blouse with criss cross back neck with catchy stone work. This off the shoulder blouse is too hot to wear with designer sarees. Wear this with diamond accessories and front puff hair style. Your styling will look on-point. We love how creative this blouse is. The blend of net and silk fabric on the blouse looks so edgy and attractive. 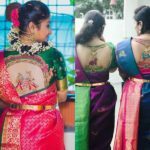 You can wear this blouse even with your silk saree. Here is a huge bridal inspiration for soon to be brides. 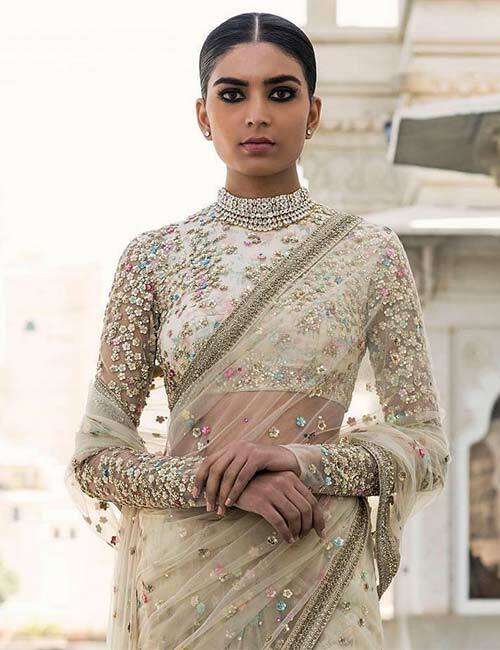 A heavily embellished net blouse is what you need to nail your designer saree on the D-day. 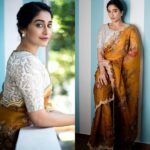 Love this playful blouse on a grey saree. And those colors are too adorable to miss out. If you are not comfortable with sheer sleeves, opt for a sleek printed layer underneath. 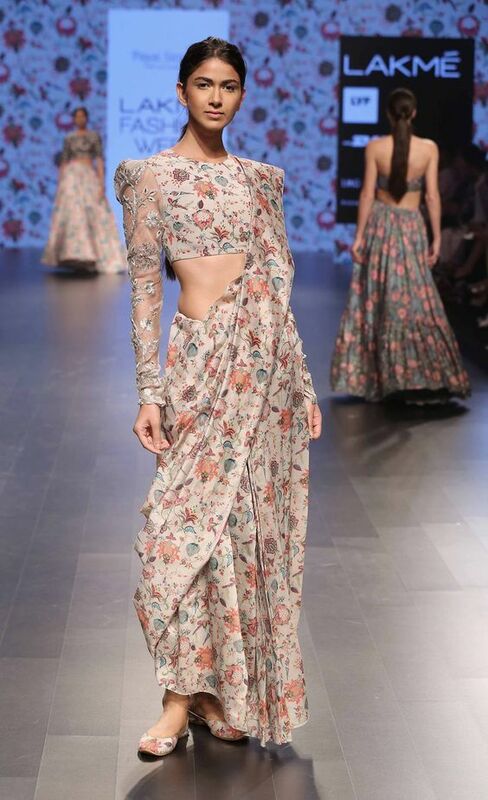 Here is Deepika Padukone looking regal in this blouse design. You can wear this blouse with all your daily wear sarees. For a fashion forward saree style, wear full sleeve net blouse with collar neck. For an indo-western look, wear traditional saree with see-through peplum blouse. 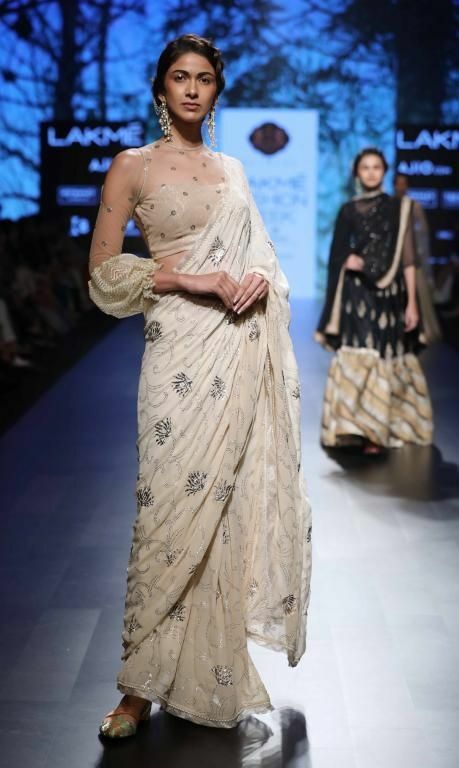 For a slim saree style, try sleek net sleeves with dense embellishments around the wrist area. Yes, net blouse can be an epitome of elegance. Glam up your blouse back neck with cloth buttons. This, with sheer sleeves, are going to make all head turn over you. For a glamorous appeal wear slip blouse underneath a net layer. Take the inspiration from Kajol here. 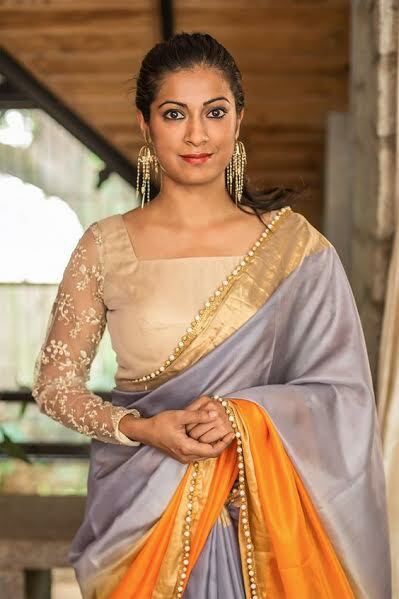 A slight puff over the blouse shoulder is going to add a fine touch to your saree style. 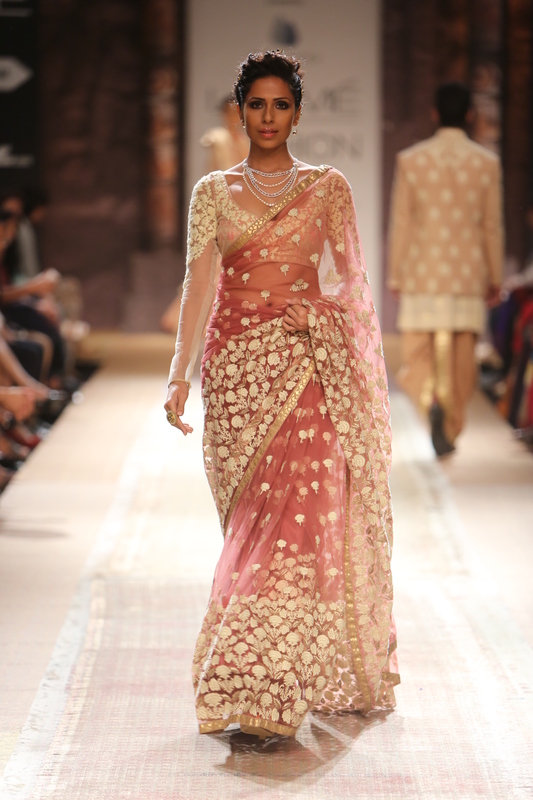 For festive sarees, try kundan embellishments on your net blouse. 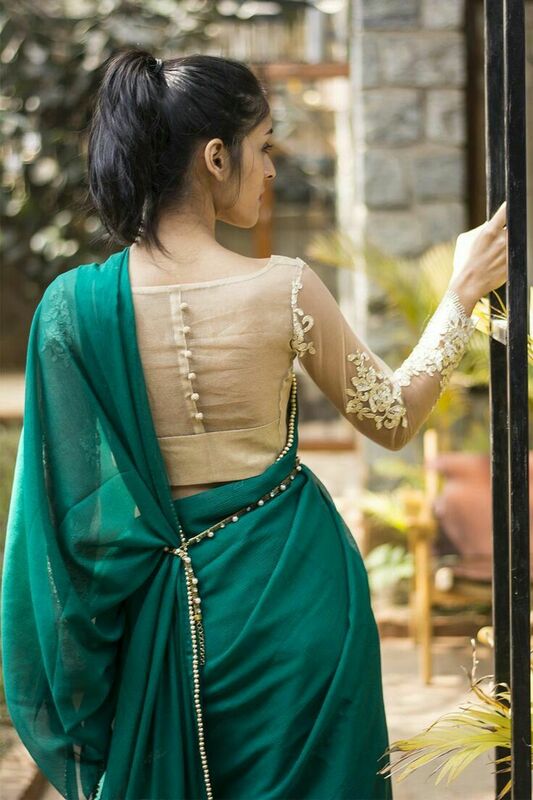 Embroidery patches over skin toned net blouse is going to keep your saree style voguish. Here is the ultimate statement blouse with sheer sleeves. Don’t miss the beauty of the gorgeous full sleeve net blouses. You can wear them from designer sarees to even simple georgette or chiffon sarees. They can be transitioned easily from formal wear to party wear. Yes, the same black net blouse can be worn to your office and also to your friend’s party at the evening with just the change of saree. Own this most coveted blouse model and you will thank us for recommending this!